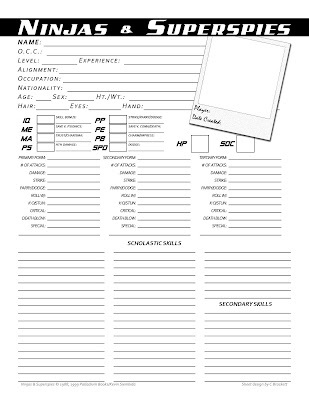 While we're on the topic of espionage RPG's, here's something I've had laying around that's not from the scanning project and not for an edition of Top Secret: a character sheet for Palladium's Ninjas & Superspies game. 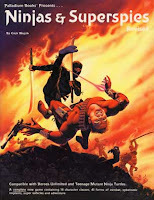 The Palladium house system may not be the smoothest rules set ever, and later additions may have taken the munckin-y aspects of the system to new heights (Rifts, I'm looking at you), but my friends and I had a blast with Beyond the Supernatural and Teenage Mutant Ninja Turtles back in the day. (And continue to do so, although much less often than we did back then.) We never played pure N&S more than a couple of times, but the martial arts rules were regularly incorporated into our other Palladium games. These three books are - aside from my Bureau 13: Stalking the Night Fantastic book - the most worn books in my collection, and for good reason. I used to use Ninjas and Superspies all the time for our TMNT games. "You used the Ninjas and StupidGuys rules too? Munchkin!" I can't think of the game by any other name now. My Palladium-crazed buddies had N&S, but they only ever used it for the martial arts stuff. When I asked them about the "superspies" part of the equation, they said it was garbage. Care to comment? By the way...Beyond the Supernatural is a sadly under-valued jewel in Palladium's paste-and-plastic crown. @JB: Well, the martial arts section was the biggest selling point of the book, IMO. Aside from that, there was a bit of cyberware for super-soldier characters, and then the usual Palladium stuff. (I think that was it - but it's been a while since I spent any real quality time with the book.) If you somehow managed to make a character that didn't take advantage of at least one of the martial art forms (although I don't even know off-hand if such a thing was possible given the OCC's in the game), then it would certainly have been less exciting. "Garbage?" Probably not - but it definitely would have been bland. However, the only characters I ever saw created for the game in its pure form had at least one martial art, so nobody ever complained. I agree about BtS. We still enjoy the Hell out of that game today. In fact, I'm running a belated Halloween game of BtS tomorrow night, if everyone stays healthy long enough. @lokipan: No, sorry. 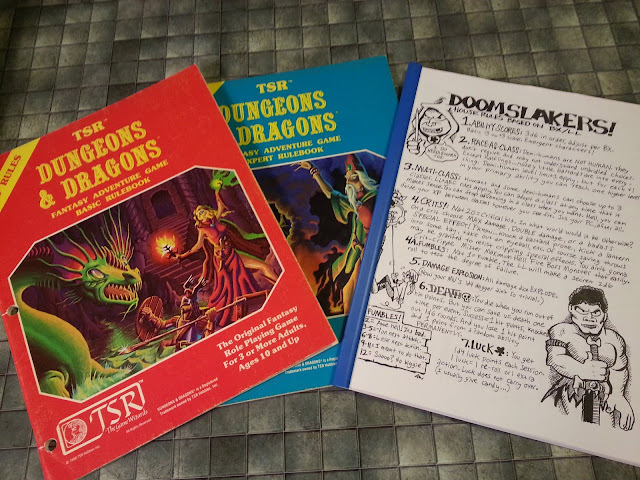 Actually, Chaosium's probably the only game company whose games I've never felt the need to create/recreate a sheet for. (Except for their 3rd edition CoC, for which I created a sheet that was almost an exact replica of the original simply because I couldn't find a copy of the original elsewhere.) I've always been fairly content with what they come up with, so even though I played a lot of Stormbringer (and a little less Elric) I never made a home-brew character sheet for either game. Nice sheet. Just stumbled across your blog while looking for something else.